1. Why didn't Porsche design their OEM "T" air intake (Air Distributor) like the IPD "Y" air intake design? 2. 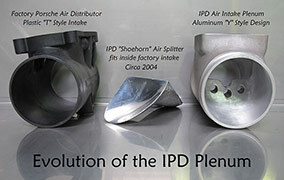 Why are the IPD Products manufactured from aluminum when the OE intakes are molded from plastic? 3. 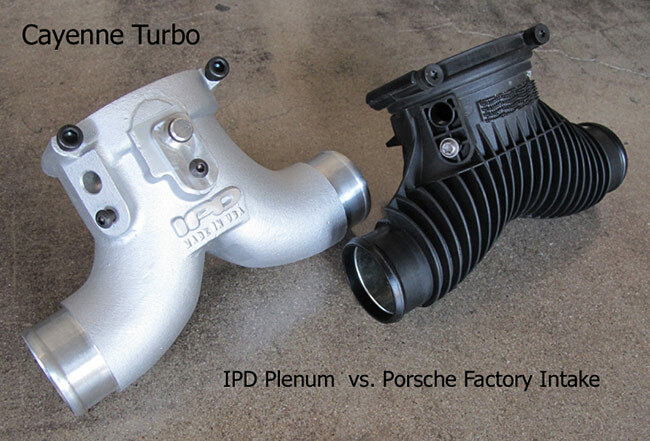 Does IPD make Plenums for all Porsche applications? 4. Where are the IPD products designed and manufactured? 5. 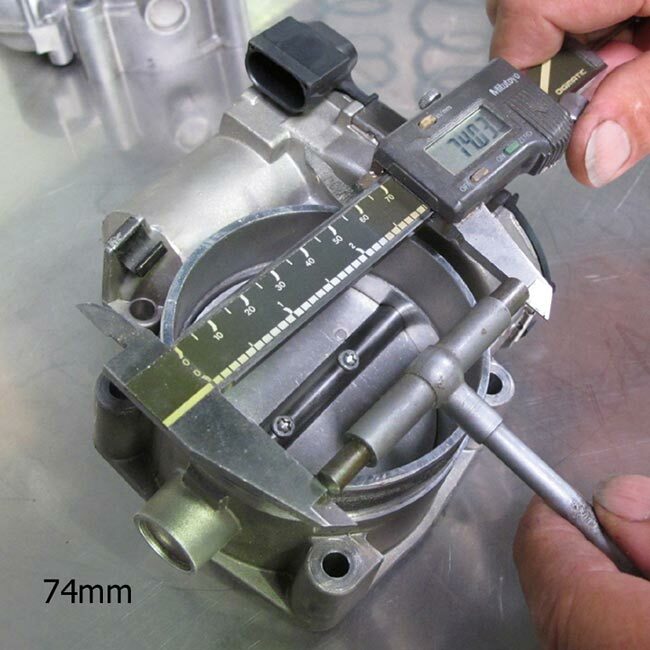 How do the Porsche Throttle Bodies differ and how do you measure TB sizes? 6. How can I order IPD Plenums? 7. Do the cast aluminum IPD Plenums experience "heat soak"? 8. Can I install the IPD Plenums myself? 9. Why are the original Plenums epoxy coated red/orange inside while the newer generation of Plenums are left raw aluminum? 10. What if the Plenum does not deliver the performance gains claimed by IPD? 11. Do I need to make any changes to my ECU/DME after installing the Plenum? This is without a doubt the most commonly asked question of IPD and the answer is simple, "We have no idea, Ask Porsche?". As we all know, production cars are not designed nor built to deliver maximum performance, that's reserved for purpose built race cars. Street cars are designed and built to be profitable, cost effective, long lasting and powerful enough to satisfy the target demographics and compete with similar niche models from rival automakers. Every single street car today can be further modified to deliver improved performance and Porsche cars are no exception. Zero compromise street cars such as McLarens, Enzos, Veyrons and Paganis are reserved for the elite car collectors with plenty of disposable income. Plus half the fun is fine tuning an already great out-of-the-box Porsche to deliver a driving experience that is perfectly tailored to fit your specific driving personality. Porsche manufactured a zero compromise car once, and it coincidentally happened just before they faced possible bankruptcy. This amazing car was the incredible 959 and Porsche lost money on everyone that was sold. Porsche has become the most profitable car company in the world because of it's incredible ability to engineer components that can be carried over from year to year, as well as model to model. The "T" style Porsche air distributor has been employed on virtually every 911 / Carrera since the 60's and wasn't changed until the advent of the new DFI cars. Everyone at IPD is a huge Porschephile and we are the loudest company to praise Porsche for everything they've done and will continue to do in the future. Porsche is the most amazing car company on the planet but their street cars aren't race cars and there is room for performance improvements throughout their entire car line. The factory "T" air distributor works well but the IPD Intake Plenum is a superior design that works better and provides performance through efficiency. The patented "Y" design Plenum offers a lower pressure drop across the merge collector than a conventional/mass production "T" air distributor. Any pressure drop in the intake tract will serve to either back pressure the turbocharger in a forced induction application or choke the intake flow in a naturally aspirated engine. Both scenarios limit the performance potential of the engine. Injection molded plastic is an ideal medium for manufacturing thousands of pieces but less than ideal for smaller production runs. This is especially true when considering that IPD offers plenums for almost 30 Porsche applications. Simple math makes the decision to go with cast aluminum an easy one, especially considering that each of the IPD Plenums receives very minor improvements and refinements with each new production run. It wouldn't be cost effective to modify a mold every time an improvement or revision was implemented. Because of this limited production concept, Porsche has utilized cast aluminum intakes on many of their high profile race cars and elite street cars, all with great success. Cast aluminum intakes can be found on the GT3 Cup Cars, GT3 World Challenge Cars, GT3 RS and GT3 street cars, (both 996 and 997 versions). Even the extraordinary 959 had an aluminum intake system. The only remaining exotic material we have not manufactured is carbon fiber, as seen in the GT3 RSR and Daytona Prototype, but who knows what the future holds for IPD. IPD manufactures plenums for a variety of Porsche applications starting with the first 996, MY (Model Year) 1999 (1998 in Europe). Although we are all huge fans of the air cooled Porsches here at IPD, we do not make any plenums for the air cooled applications. There are only a few of the modern day Porsches for which we do not offer Plenums. Please refer to the product section on the website for a complete list of all the IPD Plenums available. All IPD Product are designed, developed and manufactured here in Southern California. This includes all Plenums, Turbo Y Pipes, Silicone Hoses as well as all related fittings. This enables IPD to maintain a close personal relationship with all of our vendors and suppliers ensuring top level quality, constant communication and prompt deliveries. Things literally move fast in this industry and it is essential to be on top of product development and manufacturing from beginning to end. Having vendors and suppliers in close proximity allows IPD to react quickly during all phases of IPD development resulting in the highest quality product worthy of being installed on Porsches. 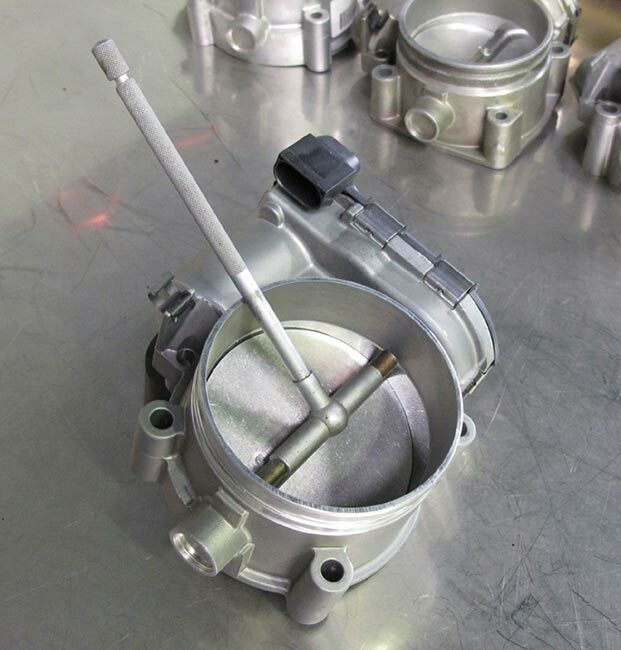 Porsche manufactures a handful of different throttle bodies with varying bore sizes. 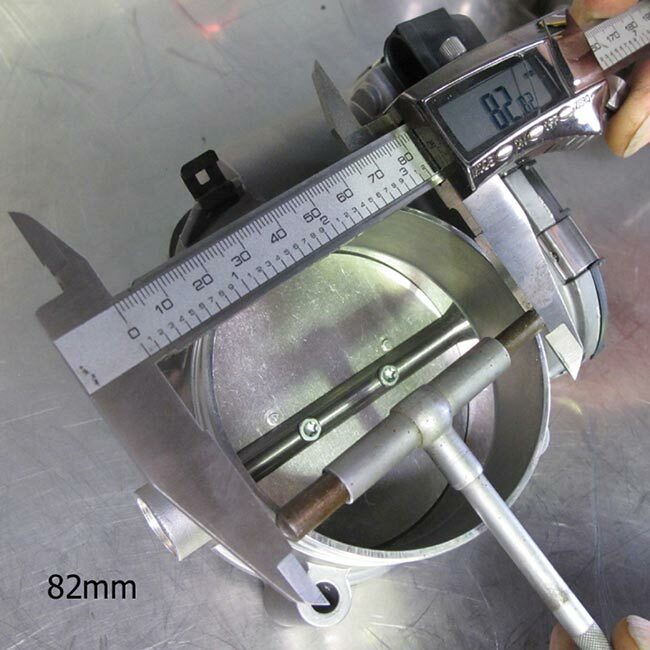 This measurement is taken at the butterfly, which is the minimum diameter of the inlet. Its important to make this distinction because various manufacturers have alternative methods of listing their sizes and it can be confusing. 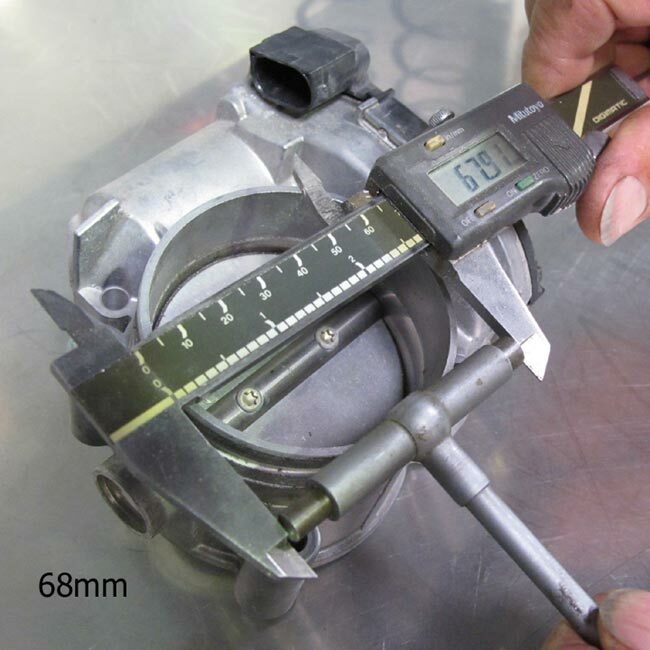 In the name of consistency we have stuck with the method of measuring the bore diameter at the butterfly shaft. TB's can only flow as fast as their most restrictive opening diameter, just like a chain is only as strong as it's weakest point. There seems to be a lot of confusion regarding Porsche TB sizes and hopefully this sheds some much needed light on the subject to clarify the issue and keep everyone on the proverbial "same page". Porsche refers to each of their TB's a little differently. At IPD we refer to each TB size as it relates to the tightest opening of that particular bore. There are 4 major Porsche throttle bodies; the 68mm, which is typically used on 996 Turbos and 986 Boxsters (E-Gas). The 74mm, which is found on almost all naturally aspirated Carreras, Caymans, 987 Boxsters as well as the 997 and 991 Turbos. The 76mm, is used on the 996 GT3, all Cayenne Turbos and all Panmera Turbos. Then there is the 82mm, which can be found on all 997-991 GT3's as well as the 957 Cayenne Turbo S.
You can purchase IPD Plenums directly from IPD via the phone or on our website through our on-line e-commerce store. All pricing will be at MSRP (Retail Price). As always, we encourage retail customers to purchase IPD products through their local Porsche tuning shops and Porsche dealerships. You will most likely receive preferential pricing on IPD products from IPD dealers since they would be performing the install. If you are not sure about "where" to purchase or have your Plenums installed please call us here at IPD and we will gladly refer you to the most qualified and reputable shop in your area that is familiar with the IPD product line. IPD has a very qualified and talented dealer network that we fully support. All IPD dealers are very knowledgeable and capable of installing any of the IPD applications. Aluminum has a relatively low thermal mass. It's capable of heating up quickly but because of its molecular packing configuration it's not capable of storing much energy. While theoretically it does have a higher thermal mass than plastic, the resulting change in inlet air temperature is minimal. At IPD we pay close attention to the whole package; not only the fluid effects of air flow, but also the thermal and mechanical. Extensive testing keeps our claims honest and we will continue to share data as we improve our product. Comparing aluminum to plastic. Aluminum no doubt gets hotter faster, but it also gets colder faster. Once the car is parked, the Plenum as well as the entire intake system, experience "Heat Soak". On the other hand, when the car is being driven the intake air being drawn through the intake system actually cools the Plenum more quickly therefore dropping charged intake air temperatures. The colder the air traveling through the intake system the higher the increase in horsepower. Cooler air is "denser" air, because cooler charged air carries more potential energy. This increase in energy allows for greater combustion within a given volume, ultimately yielding more power and efficiency. This is a difficult question to answer since we have no clue about your personal "wrenching" qualifications or mechanical aptitude. We encourage anyone attempting to perform their own IPD Plenum install to first refer to the installation guide for that specific model. This can be found in the product section of the website. All IPD Plenum installs must be perform correctly otherwise you may experience a CEL (Check Engine Light) and your vehicle will not function properly. We strongly recommend that all 996 and 997 Turbo Plenum installations be performed by a highly trained and qualified Porsche technician who is very familiar with these models and the IPD Turbo Plenums. 9. Why are the original Plenums epoxy coated red/orange inside, while the newer generation of Plenums are left raw aluminum? 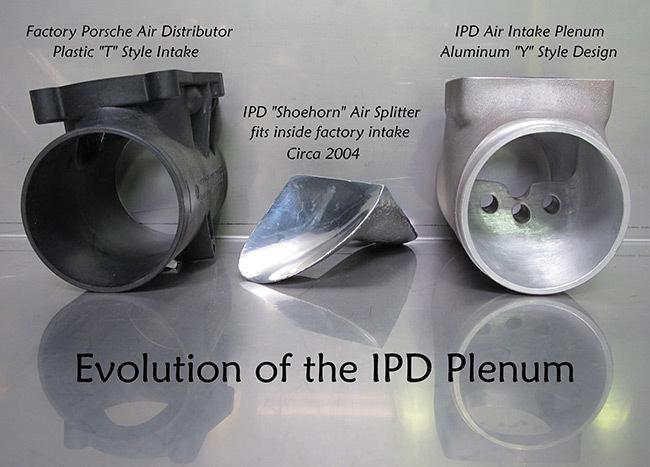 The IPD plenum has been in production for almost 8 years. 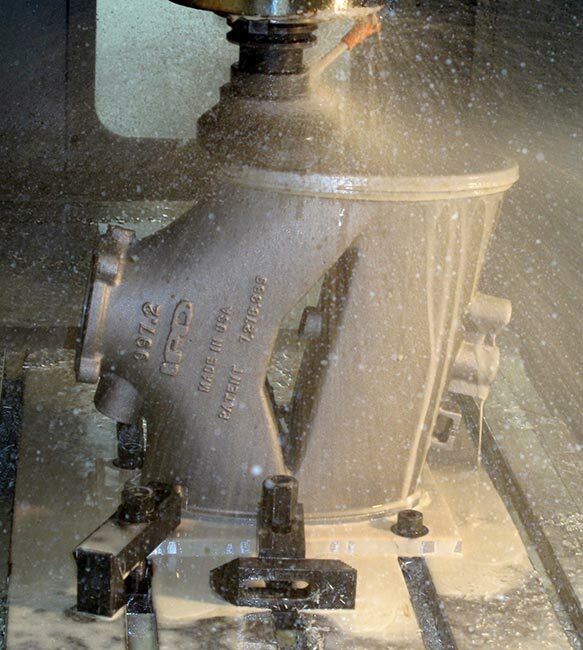 In the constant evolution of manufacturing processes and vendor improvements, we have refined our casting and finishing methods. With a more uniform interior surface and with less hand finishing, the epoxy is no longer needed. With tighter tolerances on the surface finish we can control the boundary layer to maximize flow. The shot peened internal surfaces allows for even further optimized air flow. Just like a dimpled golf ball travels farther than a smooth golf ball. Controlled turbulent air creates less friction and "tumbles" over a given area more efficiently. Firstly, the Plenum (or any other performance modification) should not be installed on any vehicle suffering from any outstanding service issues. Any and all Porsches must be mechanically sound with all scheduled maintenance and service performed before installing your Plenum. The 2 most common reasons for IPD Plenums not delivering the performance gains claimed by IPD are; incorrect installation and / or a faulty MAF sensor. Hot wire mass air flow sensors degrade over time. After thousands of heat cycles on the precious metal element you may suffer loss of resolution at the extremes of measurement (ie peak power). Although the sensor may not be so far out of range to cause a check engine light, we have seen cases where the performance improvements are not fully realized. The short answer is NO. The factory ECU/DME will make all the necessary "adaptive changes" to accommodate the additional air flow provided by the IPD Plenum. A mass air system constantly adapts for changes in the inlet tract. 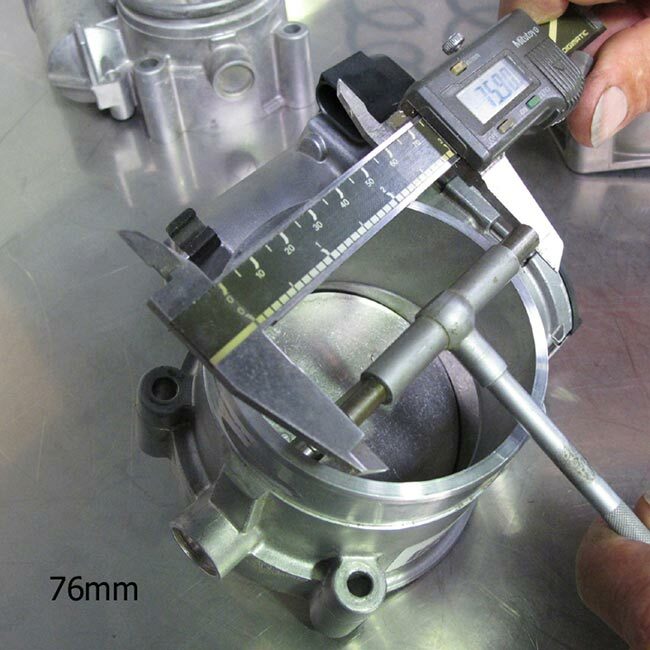 Only in very high power turbo systems are the limits of the stock mass air meter exceeded and provisions need to be made, but short of that the plenum will not cause any calibration issues. Have a question we didn't answer? Give us a call or send us an e-mail and we'll be happy to answer any and all questions.